Few entities in the avantgarde/experimental underground have been able to evoke vivid visions and sentiments of loss, immateriality, abandon, and boundless ritualistic immensity like San Francisco’s dark ambient-doom sorcerers Common Eider, King Eider. Birthed around the mid-two thousands in the wake of San Francisco’s collapsing psychedelic and art rock scene, and gravitating around the core values and aesthetics of San Francisco’s legendary Tumult and Aquarius Records strongholds, Common Eider, King Eider is an obscure congregation of veteran San Francisco sound sculptors who have established themselves as absolute leaders of the pack and unrivaled masters of creation when it comes to realm of the most darkened, immaterial, and cataclysmic sonic architecture that the human mind can fathom. 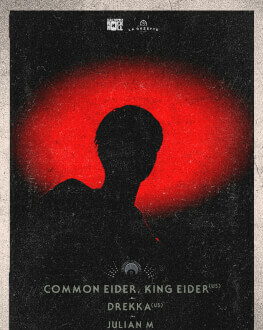 Taking cues from revolutionary and mind-expanding artists like Lustmord, Throbbing Gristle, Wardruna, Dead Can Dance, Halo Manash, Arvo Part, and Sunn O))), through their levitating, soul-shattering, and black hole-sized ritualistic black ambience, Common Eider, King Eider have elevated themselves to the rank of near-mystical figureheads in the realm of modern times dark ambient and drone music. 2018 will see the release of an EP for Cyclic Law in the summer and a LP for Consouling Sounds in October. Working under the name DREKKA since 1996, composer Michael Anderson has toured, traveled, and collaborated extensively, collecting memories and building a very personal archive of sound that dates back to the mid-1980's. DREKKA has released a large body of work on labels such as Dais, Auris Apothecary, Morc, Silber, and Anderson's own label, Bluesanct. Anderson has also recorded and toured as a member of such as projects as Turn Pale, Jessica Bailiff, In Gowan Ring, Stone Breath, Annelies Monseré, Rivulets, and Dylan Ettinger. DREKKA owes something to the soundscapes and non-linear impressionism of Cindytalk or COIL, the industrial gravity of Einstürzende Neubauten or Hafler Trio, and the cinematic collaborations of Edward Artemiev/Andrei Tarkovsky or Simon Fisher Turner/Derek Jarman. But his work is very apparently unique and personal. Throughout years of performing and recording, DREKKA has explored early industrial tape culture, fragile bedroom noise-folk, and expansive cinematic textures. His work and performances touch on themes of silence, memory, and forgetfulness. But rather than obscure himself, DREKKA functions as a direct line into Anderson's mind and his tenuous cache of memories. These personal aspects and this fragility are clearly on display, rather than being obfuscated by poetic abstractions. Just as prominent, particularly in the live setting, is a sort of confrontation; a wrestling with frenetic energy that approaches mania or ecstasy. As DREKKA's recordings serve not to obscure but to exhibit Michael Anderson's mind, his performances serve to exhibit his person, his body. DREKKA's audiences behold not an anonymous face in the glow of a laptop, but a man riding his flimsy card table strewn with tape players, bells, trinkets, metal, and pedals. They behold a man's spirit riding him, contact microphone in mouth, hands shifting cassettes collected over time and distance. DREKKA's audiences behold a confrontation of spirit, body, memory, and sound. DREKKA’s new album, a collection of rare compilation and single tracks from 1996-2001, will mark the 20th year of the project framing DREKKA as a long standing artist with a legacy and a linear thread in his work. Titled “No tracks in the snow”, the album will be out July 2018 on Dais Records.